Earlier this year I was avoiding caffeine and drinking only herbal tea. Herbal tea is really a misnomer, there is no such thing. Tea is made from leaves of the tea plant, camellia sinensis. Black tea, oolong, green tea and even white tea is made from the leaves of this plant. The different styles and colors come from how it’s processed. Herbal teas are more properly tisanes, a French term coined in the 1930’s. It can contain herbs, flowers, spices or other plant material. It is generally caffeine free. I’m always trying to find tisanes that taste like something, anything. Often they are too bland or one strong flavor like licorice or rose hip takes over. 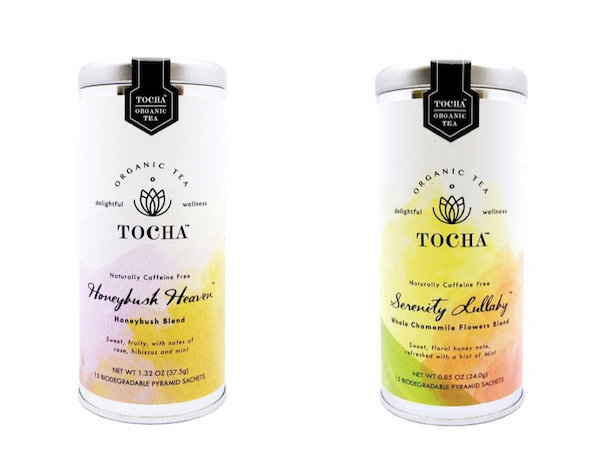 Recently I discovered two fantastic blends from a small company called Tocha Tea. They were created by Venus Tsui, who was struggling with getting enough sleep as a new mom, and turned to a book of old Chinese remedies. 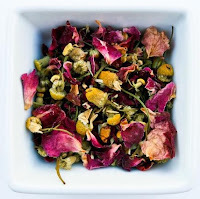 The teas were inspired by her experience with herbs and are packaged in biodegradable sachets so you can see the pretty petals and herbs in each one. The packaging is also gorgeous! But what I like best about these tisanes are their lovely aroma, flavor and their relaxing properties. They have no added flavorings or colors. They are truly all natural. This tea is so pretty and fragrant it looks like potpourri!, To support sleep it also has all organic mostly floral ingredients—chamomile from Egypt, rose petals from India, osmanthus from China and mint from the US. Just a cup is perfect before bedtime as a relaxing ritual. But I could also see having a cup on a stressful or day or taking it with me into the bathtub. It would also make a terrific gift, although I'm so fond of it I've already bought myself another canister. 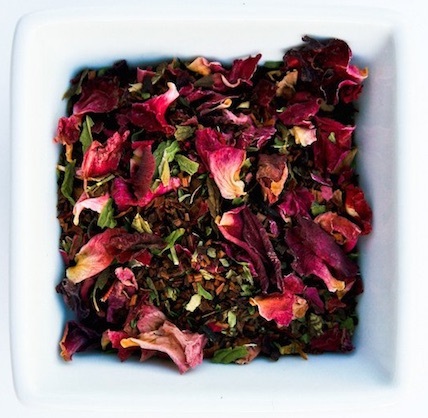 This tea is a perfectly balanced blend of all organic herbs and flowers— honeybush from South Africa, rose petals with India, mint from the US and hibiscus from Egypt. I say balanced because hibiscus can sometimes dominate and in this blend it doesn’t at all. It’s juicy and has a natural sweetness so I find it doesn’t need any added honey or sugar. It's good any time of the day but I particularly like it in the morning. It's has enough flavor to complement baked goods served with butter and jam. These teas are available in local Seattle area markets and online. Disclaimer: I received these teas as samples, but was not compensated monetarily for this or any other post.